Hi, hope you're weekend is going great! I was downstairs in my craft room today breaking down boxes and putting samples away. 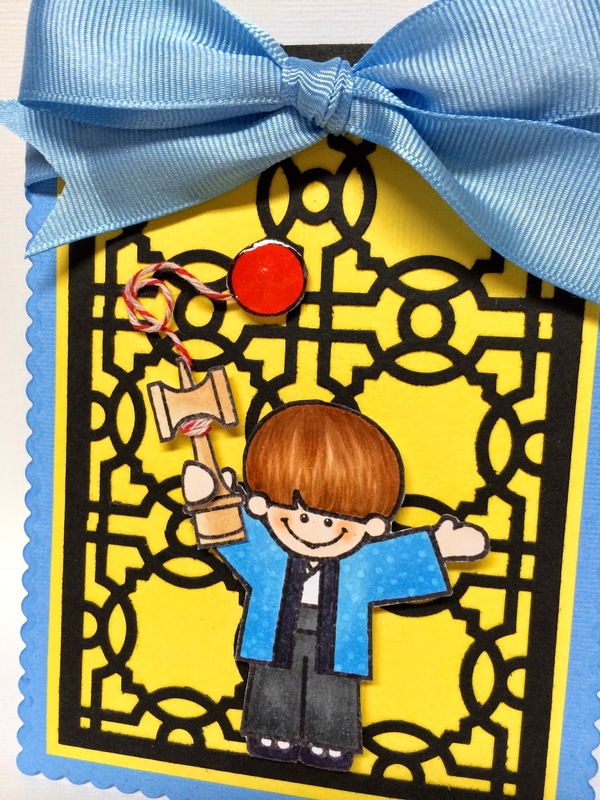 I also got distracted and sat down for a moment to make a card using Dandelion Designs new Kendama stamp set. I colored him with my copics and I'm so glad that they are still working. A couple of them are dried up since I haven't colored in such a long time! I decided to use a MS punch that I have for the background and I can't remember the name of the punch but this was the first time that I used the magnetic one. It was hard to get the circles even. Plus, you can't use a real heavy card stock to punch. I can't believe how quick the days are flying by. Mother's Day will be here in a couple weeks. Thanks for stopping by today and hope you have a great Sunday!!! During the week I received a package in the mail from Mama Elephant. I have to say, they are so quick with sending orders out and on time. Anyways, I was so excited to play with my new dies. I had a pile of scrap on my craft table so I just took from the pile instead of cutting up new paper. It's a vicious cycle. Lol! I had just enough of that blue star paper from the project in the previous post. 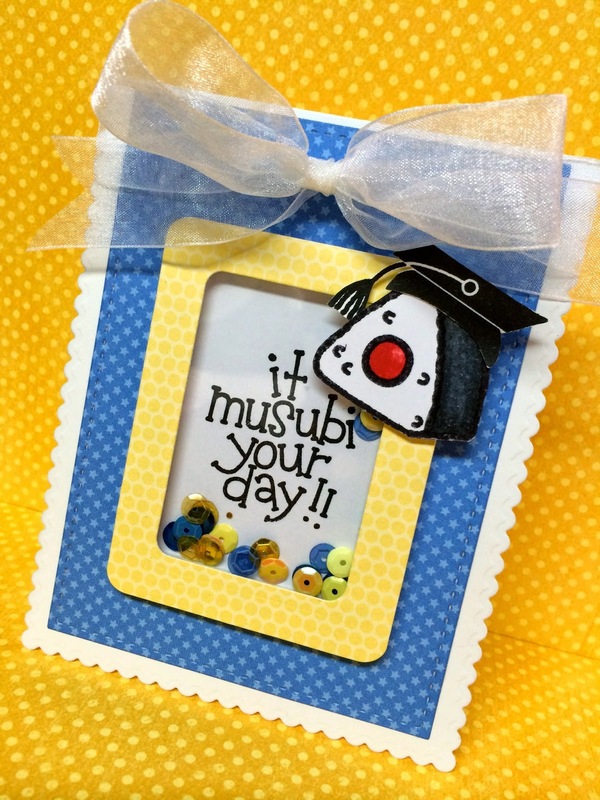 And I had this stamped Dandelion musubi image in the scrap pile. So I decided to make a shaker card using Doodlebug Designs sequins. It was quick and easy. Hope your weekend is going well. I can't believe Easter is tomorrow. Enjoy your day and I have a bunch of eggs to boil! Happy Easter!!! Happy Good Friday!!! I just received this new box die from Sizzix today. It is from the newest release in the Where Women Cook line. Perfect size to package baked goods and pass out to family and friends. It made me think of Boy's Day which is coming up in a couple weeks. 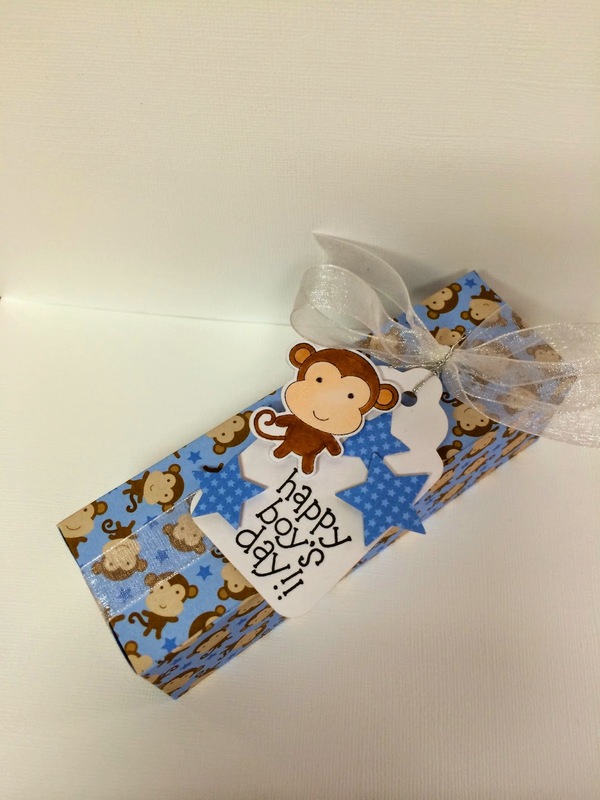 I used Doodlebug Designs card stock to make the box. 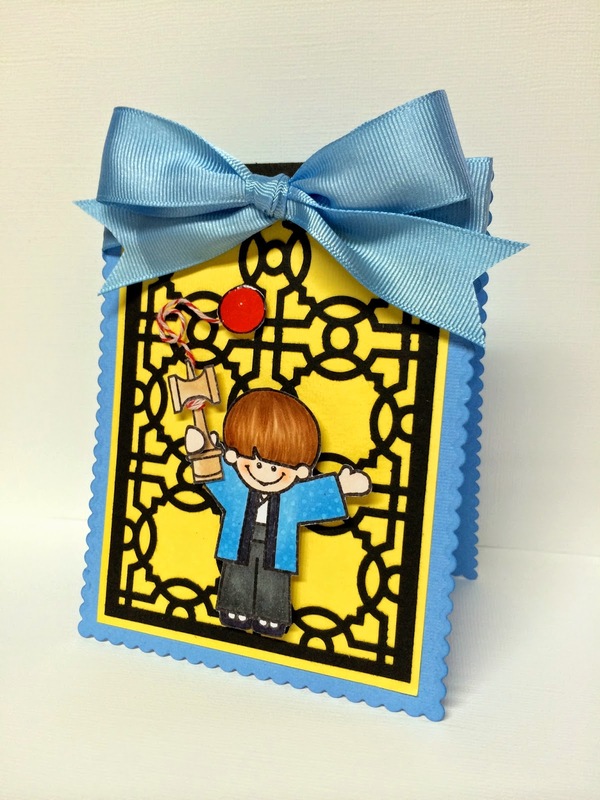 And an older Sizzix tag die. I actually forgot that I had the matching Doodlebug baby stamp and die set so I was able to match the stamped monkey with the paper. 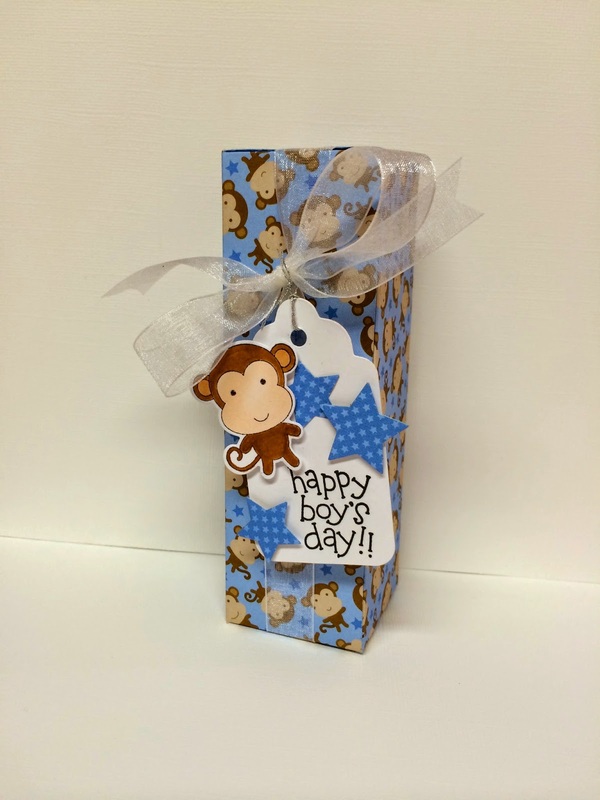 The blue stars is the opposite side of the monkey paper. Hope you're enjoying your holiday weekend! I forgot to mention, Happy Easter too!!! I wanted to share this birthday card that I made for my husband. Ssh... his birthday is on tax day and hopefully he won't see this. I've had this screen door die for awhile. It's by Cheery Lynn Designs and even comes with the real screens. It was one of those impulse buys and then not knowing what I really wanted to make with it so I tossed it to the side and forgot about it for a year. And that's how long it took me to clean one of the piles behind my craft table. I love this years Doodlebug Designs spring papers! They are so bright and cheery. I used Taj Clubhouse stencils to make the cat and mouse and Lasting Impressions papers. Stamped sentiment is by Hero Arts. Well, I'm still working on my taxes and hopefully will be able to mail it in before the deadline. At least its a good reminder for my husband's birthday. Please do not download, duplicate or print any images or content from this site without permission from me. Do the right thing kay. July's Joy of Crating Show!